You finally have a moment to yourself at the end of the day, but it's precisely then that the gloom starts to descend. You wonder: "Will I sleep at all tonight? Should I just stay up for a while and not even try? Maybe a couple glasses of wine would be good?" When the whirr of the day settles down, is that the time when you lose control of your thoughts, and start thinking about your ex? Or maybe it's the other woman, or the vacation they're on together, or your fears about being alone forever and ending up living under a bridge . . . . Welcome to part three of a series that gives The Dynamic Divorcée's special sauce to dealing with some devastating and frustrating experiences that almost all of my divorce coaching clients live with on a daily basis. If you're catching up with the series . . . Here's the first installment, How to Get Relief From Exhausting Waves of Grief -- all about how to press pause on these exhausting emotions by having tiny infusions of joy at your disposal. Here's the second installment, How to Create Your Divorce Emotional First-Aid Kit -- which I like to call your happiness treasure chest. In this post, I share what's in my own emotional first-aid kit and I share a sample Youtube playlist with my favorite mood-changing 2-minute video, some relaxing binaural beat recordings (that would be perfect to try as part of the bedtime ritual below, plus a couple of kick-a** girl-power songs that shift even my most dismal mood in a hurry. 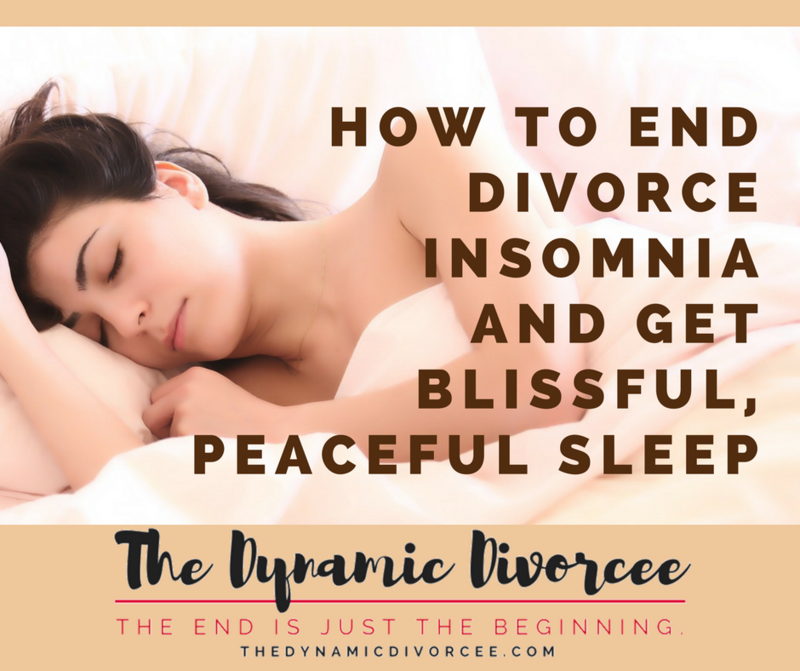 And in this week's divorce recovery hack, we're saying no to having our sleep hijacked by our pain, our fears, and our exes. First, let the scared, hurt, and angry person inside you know that help is on the way. You're not going to let this sleepless situation continue without, at least, trying out a little magic along the way. 1. Take a look at what leads up to bedtime being stressful and frustrating. You might not be able to banish all thoughts of your ex-husband or your worries, but there are some things you can control. And doesn't any amount of control feel good these days? Is it that there's zero downtime from the moment you get home from work until your head hits the pillow (so, by bedtime, you're more keyed up than you've been all day)? Is it that what you're doing to wind down actually contributes to your stress? Are there ways that you can engineer evenings to be a little more chaos-and-conflict free? You may not feel like thinking about the flow of your evening hours, but rest and relaxation are more important than ever in order to cope with the life changes you're going through. It will be so worth it to come up with an evening routine that builds in time to relax and recenter yourself. 2. What does your current bedtime ritual look like, and how does it makes you feel just before you go to sleep? Take a look at how you wind down in the hour or so before lights out, and how does that activity make you feel? How would you like to feel instead? 3. Based on what you've discovered above, what do you think might help? What sounds relaxing to you? What could you do (or not do) that would give you a feeling of peace and "ahhhhhh!" Can you make your bedroom a more restful, quiet place? Less clutter, fewer electronics, more cozy textures and bedtime lighting? Soothing music or a trippy meditation track? Maybe you want to subtract instead of add to your bedtime ritual. What do you not want to do anymore? What are the first things that pop into your mind when it comes to a new bedtime ritual? It might be as easy as a cup of warm milk with honey and an uplifting book that brings you peace and hope. Maybe it's scribbling all your worst thoughts on a few pieces of paper, tearing them up, releasing them to the dark place they came from, and flushing them down the toilet. Maybe it's who you do or don't talk to in the couple of hours leading up to bedtime. 4. The last step is troubleshooting: What or who might get in the way of your more relaxing, more soothing, more self-nurturing new bedtime ritual? (Your kids? Another family member? Maybe even yourself, if you tend to think, "Why bother?") Whatever the obstacle may be, decide on your secret plan to make sure your bedtime experiment gets a chance to happen. The cure for divorce insomnia: Make your new bedtime ritual so cushy and cozy that you can't help but try it. Click to tweet.